Last Saturday, Ridecamp here was half full of rigs and people and horses and dogs for the Almosta Bennett Hills endurance ride. 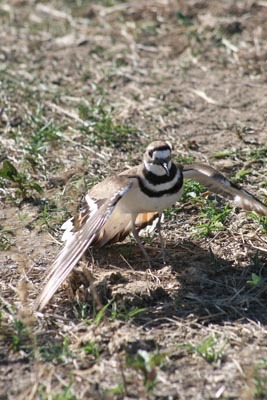 I was roaming about with my camera on the four-wheeler when I saw a killdeer run along the ground. 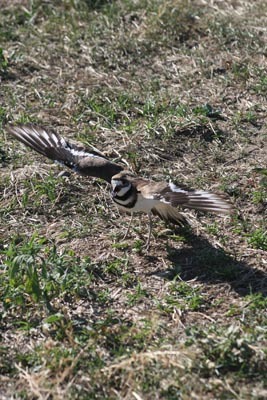 I looked to where she was running away from, and moved in that direction, and mama killdeer went lame, doing the broken wing display, trying to draw me toward her and away from... her nest with 4 eggs. 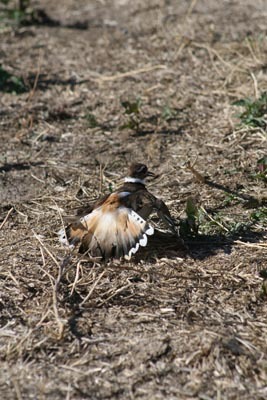 eanwhile, mama killdeer was flopping and fluttering away, an injured bird in great distress. To appease her, I backed away from the nest. Which happened to be not 10 feet from a big horse trailer that had just missed it when it drove in and parked - rather an inconvenient location! 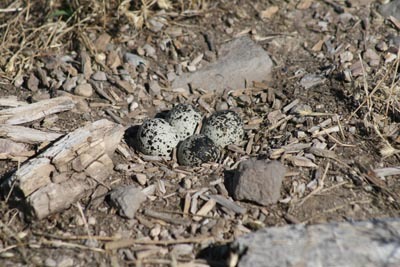 But then, how could nesting in the open on the ground anywhere be convenient? 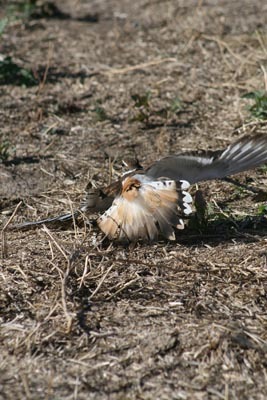 It must work, because that's what they do, and there sure are a lot of killdeer around here. 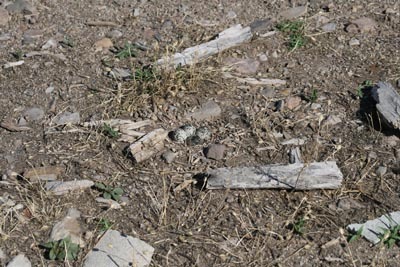 (A couple years ago, we discovered a killdeer nest right by our busy finish line - those killdeer went on to hatch and fledge). 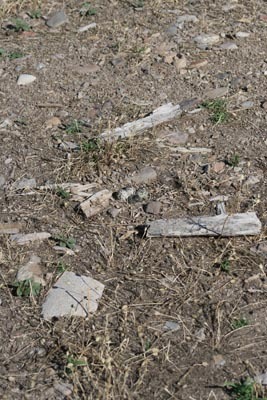 I got a couple of fencing posts and roped off 2 sides of the nest so horses and rigs would keep clear. 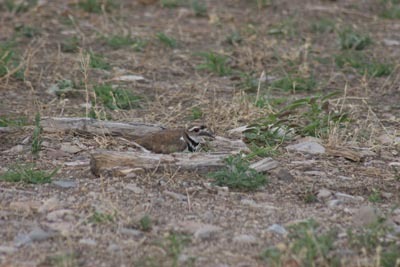 Horses and riders and dogs went about their business all weekend; mama killdeer went about her business, sitting on her nest. 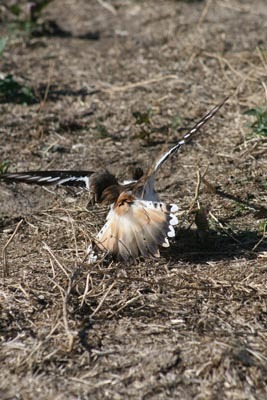 In their courtship, the male killdeer will make loud calls and sham nest-scraping movements. The male builds the nest. (This one was merely a little scraped out depression, though the placement among the camouflage decor was great.) The male and female will share nest duties... but I have yet to see two birds around this nest - you'd think I'd see two of them at least once. Killdeer eat mostly insects, and with all the dang flies around here, mama probably doesn't even have to leave her nest to eat! When the chicks hatch, they will be downy, open-eyed, mobile at birth, and will find their own food while following their parents. They should fledge in 25 days - fly competently - so hopefully I'll catch the hatch and get to keep an eye on the babies a while. 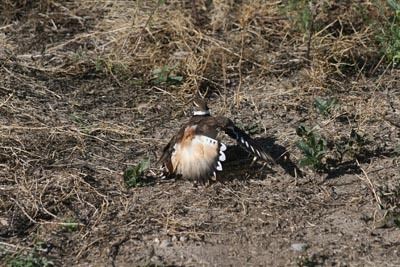 I rode Stormy close to her today (the killdeer will do the distress show for humans and dogs, I've noticed, but not for horses), a week later, and she's still sitting patiently on her eggs. She didn't bat a bird's eyelash at us.